In the 6th arrondissement of Paris, Le Christine welcomes you on the street with the same name. 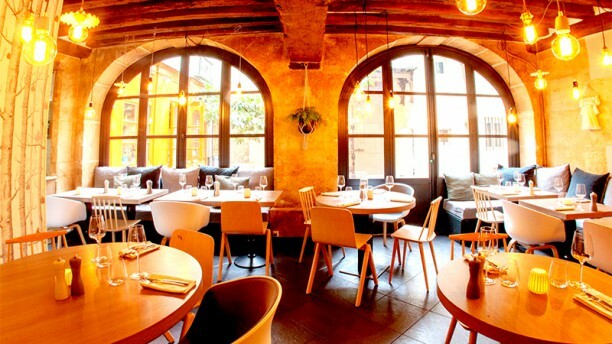 The restaurant is open for business between Saint-Michel and Saint-Germain-des-Prés, in a trendy atmosphere. Le Christine invites you in a warm and bright space showcasing beautiful stones and exposed beams. While waiting for your suite, enjoy exhibitions of works of art that adorn these beautiful walls. While keeping an eye on the preparation of the dishes, enjoy the aroma of traditional and reinvented French cuisine. Inspired by excellent seasonal produce, the chef will prepare delicious dishes. Indulge in foie gras cooked au torchon [in a cloth], accompanied by its delicious stewed red onions with grenadine or fillet of beef of the restaurant. Don't miss the sweet notes of the tiramisu reinvented by our Chef, a real treat! The restaurant will introduce you to some organic wines that can accompany your gourmet moments. In order to enjoy greater privacy during private or business meals, Le Christine can be partitioned. The restaurant overlooks a beautiful paved courtyard classified as 17th century, just a pleasant location in terms of view and taste!" We visited this place on our first trip to Paris 7 years ago and decided to go there again this time. And we loved it! again! Outstanding value, terrific creative cuisine. what a pleasure to discover your wonderful review, thank you infinitely for publishing it at the end of this experience at Christine ! All our team does its best to provide you the best tasting in our restaurant of St-Germain-des-Prés, and there is nothing more rewarding than knowing you enchanted by the taste of dishes served to you ! thank you infinitely for publishing this excellent review following your experience at Christine ! There is nothing more rewarding than knowing you enchanted by this tasting in our restaurant of St-Germain-des-Prés, and your congrats will be conveyed to our chef and his team ! Great service and food. Nice atmosphere. We were delighted to welcome you in our restaurant of St-Germain-des-Prés, and there is nothing more rewarding than knowing you enchanted by this tasting among us ! Your congrats will be conveyed to our whole team. High quality food with awesome dessert, we were two very happy customers to try the lunch specual ???? what an enjoyment to discover your excellent review ! Thank you infinitely for publishing it following this experience at Christine ! All the pleasure was for us to welcome you, and there is nothing more rewarding than knowing you overjoyed with our food, especially our desserts ! The food was creative, but seemed like unfinished thoughts that didn't quite meld. The servers were fantastic and very knowledgeable about the food and wine!! Always enjoy it here- we come every time we are in Paris! what an enjoyment to discover your wonderful review, thank you infinitely for publishing it following this new visit in our restaurant of Paris ! It is always a pleasure for all the team of Christine to welcome you, and knowing you fully satisfied following each of your visit is very rewarding ! Accommodating in every way, and dinner was sublime. Extra points for dessert, which I don’t normally go for but as was included in prix fixe, figured I’d try. Dessert ended up being a highlight of the meal! our warmest thanks for publishing this excellent review following your visit at Christine ! All our team does its best everyday to make you enjoy the best tasting in our restaurant of St-Germain-des-Prés, and knowing you fully satisfied by your experience is extremely rewarding ! it is a real pleasure to discover your wonderful review, thank you so much for publishing it following this experience in our restaurant of St-Germain-des-Prés ! There is nothing more rewarding for all our team than knowing you fully satisfied by this experience among us ! We are delighted to note that this visit at Christine will left you beautiful memories ! Food was ABSOLUTELY devine. All four of us were delighted. The welcome was very friendly and open, despite 2 out of 6 of us cancelling due to sickness. The dessert mademy head explode - yummie! Great service, great kitchen, OK pricing for such good quality. Thank you! it is a real pleasure to discover your beautiful review ! Thank you infinitely for publishing it following this experience at Christine ! All our team is always happy to welcome our guests, and does its best to make them enjoy an excellent tasting in our restaurant of St-Germain-des-Prés. All your congrats about the dishes proposed to you are very rewarding ! Feel free to renew us your confidence, we will be happy to welcome you again ! Service is not good but food is fine. thank you for sharing your feelings with us, following this visit in our restaurant. Even though it is a pleasure to know you seduced by the food proposed to you, your remark about the quality of our service is holding our attention. Indeed, all our guests are generally very happy about that, and our team does its best to welcome you the best way. Please make sure that we will not miss to rely on your comment to improve ourselves. Did the “trust the chef” menu and it was amazing! Great wine list accompany amazing food. thank you infinitely for gratyfing Christine from this excellent review ! We are overjoyed to know you seduced by our chef menu, and your congrats will be conveyed ! Moreover you appreciated the wine selection proposed to you, what we are delighted with ! it is a real pleasure to discover your wonderful review, thank you infinitely for publishing it about this visit at Christine ! We do our best to provide you the best experience and discovering your congrats are very encouraging for all our team ! it is a real pleasure to discover your amazing review, thank you infinitely for publishing it following this experience at Christine ! We are delighted to know you fully satisfied by the taste of dishes proposed to you, and your congrats will be conveyed ! the food is high quality and the service is very helpful. the atmosphere is also very comfortable. thank you infinitely for sharing this wonderful review with the other internet users, following your visit at Christine ! We are delighted to know you enchanted both by the food proposed to you, and the service of our team, always happy to welcome our guests ! The food and atmosphere was very good. Next door to our hotel, so very convenient on a relaxing Monday night. They were quite booked, mostly with foreign patrons. we are happy to discover your beautiful review, thank you for publishing it following this visit at Christine ! Your satisfaction is our main concern, and we are happy to know you delighted with this experience in our restaurant ! Chic and lovely meal as usual. thank you so much for publishing this positive review following your experience at Christine ! It is a pleasure to know you seduced by the cozy atmosphere which reigns in our restaurant ! You also appreciated the dishes proposed to you, what we are delighted with ! The Christine is a very nice resaurant for a dinner amongst friends or business. thank you so much for sharing this positive review about your experience at Christine, our restaurant of St-Germain-des-Prés ! Satisfaction of our guests is our main concern, and there is nothing more rewarding than knowing you seduced by the dishes proposed to you ! The staff members were great and very helpful. thank you so much for gratifying Le Christine from this beautiful review ! Our team was happy to welcome you in our parisian restaurant, and is delighted to discover all your congrats towards them ! We hope that dishes proposed to you fully met your expectations.